Vision Statement: Tired of PowerPoint? Try This Instead. Graphic recording (or visual facilitation) consists in capturing in a graphical form the discussion and the interaction of a meeting. It’s a valid alternative to powerpoint, useful both to summarize the group conversation “but also as visual references for key goals or processes.” “The goal: to help people make connections and better recall key points.” (HBR). 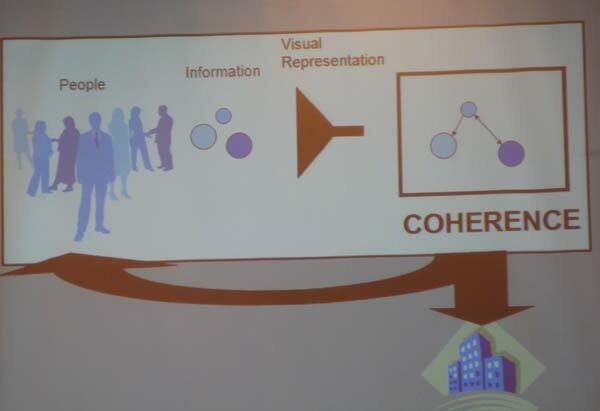 It comes in the form of large paper murals drawn by specialized artists, or in an electronic form, supported by graphic facilitation software that projects the collaborative visualization, and has the advantage to get the participants highly involved because they are creating the visual representation themselves. visual search engines are getting more and more useful and popular. So popular that Google is said to be interested to acquire them, according to today’s news on the Wall Street Journal Europe. Like.com is a comparison-shopping website from California, that allow the users find cloths that look alike (see the picture below). A similar function, based on image recognition technology, is offered by the Pixazza Inc. that “helps Web users purchase products they see in photos on some celebrity or home-design sites” (WSJE). The Strategic Management Society is organizing a one day Workshop on “Mapping Change, Changing Mappings: Conceptual Shifts in Strategy“, in Venice September 10th 2010. This academic panel from prestigious universities of Europe and U.S. is using novel and intriguing concepts and wordings, such as “concept morphing by metaphors”, “analogies and blends in strategy” and “grammar of conceptual shifts in strategy”. Sounds very promising! I hope they’ll have some documentation online. You are currently browsing the Sabrina Bresciani blog archives for August, 2010.